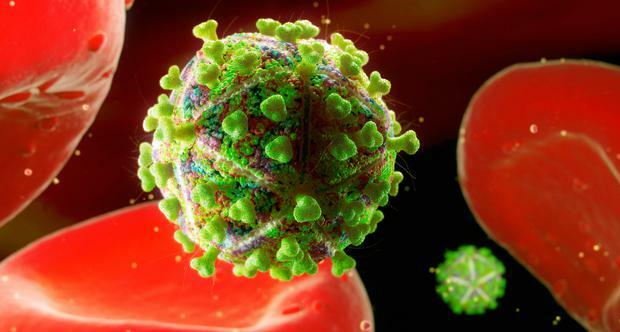 The HIV virus attacks and kills immune cells leaving patients highly vulnerable to other infections. A South African child born with HIV has surprised experts by appearing to be effectively cured of the AIDS virus after just a year of treatment followed by eight and a half years drug-free. Patients with HIV would normally need to stay on antiretroviral (ART) drugs for the rest of their lives to keep AIDS at bay. But this child, still off treatment and now almost 10 years old, has no signs of the disease. Yet experts urged caution, saying the case is extremely rare does not suggest a simple path to a cure. "It's a case that raises more questions than it necessarily answers," said Linda-Gail Bekker, president of the International AIDS Society (IAS), which is holding a conference in Paris this week. "It does raise the interesting notion that maybe treatment isn't for life. (But) it's clearly a rare phenomenon." The child, whose name and gender were not disclosed, was part of a clinical trial in which researchers were investigating the effect of treating HIV-positive babies in the first few weeks of life, and then stopping and starting the ART medicines whilst checking whether their HIV was being controlled. The United Nations HIV/AIDS agency said last week that 19.5 million people - more than half of the 37 million patients with HIV - are now on treatment. The vast majority of patients with HIV suffer an increase in the amount of the virus circulating in the body if they stop treatment, but this child was different, the South African researchers said. "To our knowledge, this is the first case of sustained virological control from a randomized trial of ART interruption following early treatment of infants," they said in a summary of findings presented at the IAS conference on Monday. The baby contracted HIV from its mother. Treatment with ART started when it was almost nine weeks old but was interrupted at 40 weeks when the virus had been suppressed, and the child was monitored regularly for any signs of relapse. "At age 9.5 years, the child was clinically asymptomatic," the researchers said. Sharon Lewin, an HIV expert at the University of Melbourne and co-chair of the IAS's HIV Cure and Cancer forum, said the case threw up possible insights into how the human immune system can controls HIV replication when treatment is interrupted. Yet in terms of the scientific search for a cure for HIV and AIDS, she told Reuters, it appeared only to confirm previous reports of similarly rare cases. "We know that very rarely, people who have had treatment and stopped it are then able to control the virus." The HIV/AIDS pandemic has killed around 35 million people worldwide since it began in the 1980s. Fay Abuelgasim and Samy Magdy Tensions escalated in Sudan yesterday after talks broke down between protesters and the country's military rulers, who called for the reopening of roads blocked by sit-ins established during the uprising that drove President Omar al-Bashir from power. Alex Matthews-King A pair of mountain gorillas, some of the most endangered creatures on Earth, have been snapped in an uncannily human pose in a selfie with rangers in the Democratic Republic of Congo.